A moisturizing cream with smooth and light texture. 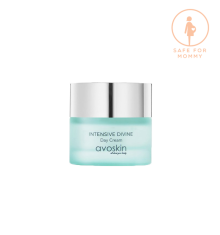 Avoskin Intense Divine Day Cream contains the best formula with marigold essentials oil, ETVC, and apple extract, that will protect your skin from free radical and UV exposure. Hydrating and protecting skin for radicals that cause UV exposure and pollution. Preventing wrinkles, dull skin, fine lines and uneven skin tone. Moisturizing and brighten skin all day long. Reducing dark spot and blemish, it makes the skin clear and radiant. Improving skin elasticity and stabilize the production of sebum. Can be used as a moisturiser befire using makeup, so your makeup stay durable. Apply it evenly on face and neck regularly. Use it every morning after clean face and avoid contact with eyes.